Last week, I talked about being more positive paying the bills. You can read it again here. 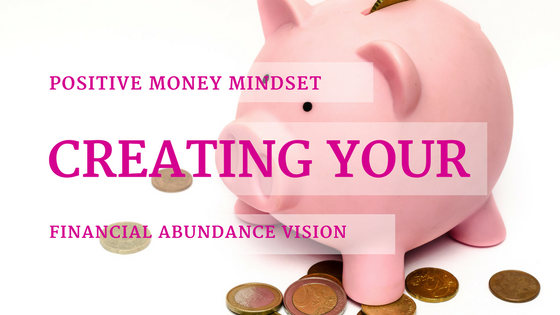 This week, I wanted to continue our money talk by sharing with you a portion of my 2-hour digital workshop, Creating & Living a Life That You Love, and help you create a financial vision that will guide you when you set financial goals. Next Wednesday, I’ll share with you my goal setting process to enhance this process even more. When creating any vision, and money is no exception, we have to get very clear about what it is that we want. Before going anywhere, you have to decide what you want, otherwise, you might be feeling like you are going around in circles, not actually getting anywhere and really confused about what it is you should do next. Don’t get hung up on the how while you are in the vision phase. Many people stop before they even begin because they can’t imagine how they are going to achieve what they want. During this vision phase, you don’t need to know how you are going to get to where you want to go because that isn’t the first step. The first step is what and why – the vision. How much money would you like to retire with? How do you feel about your income, savings, and investments? What is the view you have? What is the landscaping like? What kind of furniture do you have? How do you feel when you are in your home? Are there any other possessions that your financial vision will provide?